UDM Downloads > GdPicture Light Imaging SDK Site License! 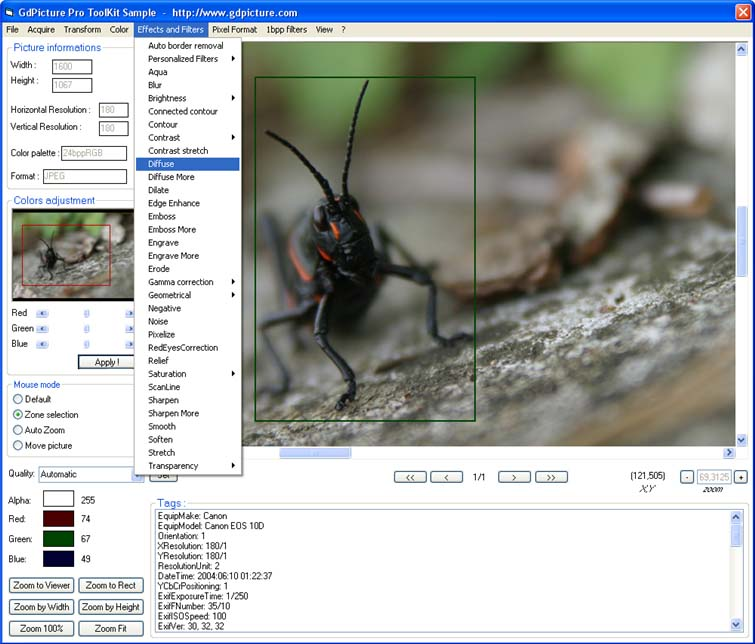 GdPicture Light Imaging SDK - Site License is an ActiveX component to view, acquire, create, edit, print, convert, enhance, and compose bitmap or vectorial image. GdPicture Light OCX supports image formats like tiff, tif, jpeg, jpg, png, pdf, ico, wmf, gif, exif, bmp, dib, fax, emf, jfif, pnm, pcx, jpe... GdPicture Light OCX can be used from any 32 or 64 bit Windows (98, NT4, ME, 2000, XP, 2003, Vista...) development environment that can call OCX components like vb6, c# or vb.net. * ActiveX image control containing over 450 functions. * ROYALTY FREE. * High performance and speed. * Easy to use. * Frequents and FREE UPDATES. * Many sample codes. * Forum support. Specifications: - Support lzw, ccitt3, ccitt4, rle and Jpeg compression - Support for 1bit, 4bits, 8bits, 16bits, 24bits, 32bits, 48bits and 64bits pallets color - Advanced image processing - Multipage Tif image file reading and writing - Drawing barcode - Image enhancement functions - Import / Export from clipboard, IStream, HBitmap, byte array etc... - TWAIN acquisition from webcam, scanners or capture cards using the TWAIN 1.9 specifications - Pallets colors conversion - Automatically trim an image to remove blank or color space around the edges - Watermark photo, text or shapes using alpha channel - Make Thumbnails - Skew and de-skew image - Read / Write EXIF, Thumbnail, Extra, GPS Tags... - Printing support using GDI+ - Merge and combine Images - Resizing with 8 diferent interpolation modes - Drawing lines, ellips, round, bezier, curves... - Change brightness, saturation, contrast, gamma - Lot of filters and effects (sepia, emboss, blur, edge enhance, engrave, smooth, negative, red eyes correction...) - Process a specific region within a bitmap - Capture the contents of any window or section of any window - Anti-alias an image This license entitles an unlimited number of developers in your organization to write software which accesses to GdPicture light OCX.